The DVD Players we sell have TV Guardian embedded, but not activated. In much the same way many software programs come preloaded on new computers, your DVD player may have TVGuardian preloaded for purchase by paying a one-time activation fee of $29.95. You pay only once. Your payment provides you with an Activation Code that you will enter into your DVD Player using the remote to unlock the TVGuardian feature. Retrieve the Registration Key from your TV Guardian enabled DVD Player. Purchase TV Guardian Activation at any time (with the purchase of a player or after you receive the player. During the online checkout process enter your Registration Key into the comments section of the order. You must have your DVD Player hooked up to your TV to retrieve your Registration Code. (Phone Orders: Have your Registration Key ready when calling (800) 828-4514.) See the instructions found below on how to find the Registration Key. You will receive the Activation Code within 1 business day via email (online orders). Phone orders will receive the Activation Code immediately. Enter the Activation Code into the TV Guardian screen of your DVD Player. 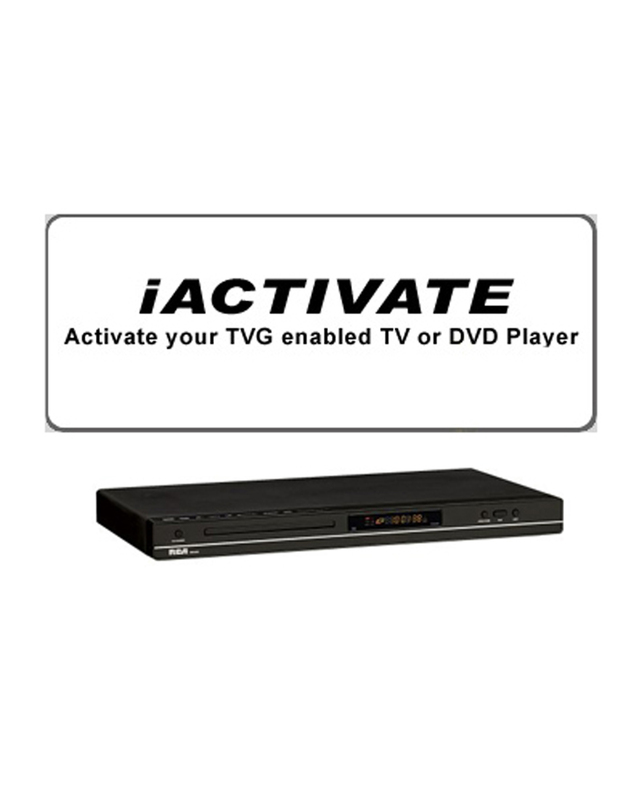 Q: Where can I find my Registration Key to Activate TVG on my DVD Player or TV? STEP 1. Push the ‘Set Up’ or ‘Menu’ button on your remote control and select ‘TVGuardian’ – it may be under the ‘Ratings’ or ‘Parental’ screen. (Note: This may be different. You may need to look through the menu options for it or refer to your manual). STEP 3. The Registration Key is displayed on the television screen. STEP 4. Purchase the Activation Code by providing the Registration Key in the comment section of your order. STEP 5. Move down to enter the ‘Activation Code’ (you may already be there). Q: Why is there a charge to Activate TVGuardian® in my DVD Player or TV? Prices have dropped so much that manufacturers are no longer willing to pay for new features like TVG. So, we came up with iActivate. We’ve convinced manufacturers and retailers that consumers are willing to pay for TVGuardian. Without iActivate, TVG would not be available at all in these products. Without your support, these types of family features will not be available at all in the future – even under iActivate. Therefore, it is extremely important that you show your support if you believe controlling profanity in your home is important. Please see the manual on how to use the TVGuardian features. Please Note: The TV Guardian features must be activated – $29.95 one-time fee. The TVGuardian feature will not work with DVDs distributed by Universal Studios. Universal Studios does not use closed-captioning on their DVDs, therefore, the TVGuardian feature will not work. See the TVGuardian for use with VCRs and Television. The closed-caption display feature, used when a phrase with profanity is muted, may not work in progressive scan mode. The TVG DVD player will support the component video (red, green and blue video) and HDMI connections. When using the player in progressive scan mode or an HDMI connection it will not display the replacement captions, but will mute the sound. ** The TV Guardian feature requires the movie be from North America (NTSC) and have closed-captioning encoded.